The Federal Trade Commission today announced six enforcement actions, including one that imposes a $450,000 civil penalty and five that for the first time address biodegradable plastic claims, as part of the agency’s ongoing crackdown on false and misleading environmental claims. The plastic cases include a complaint against a company that markets an additive it claims makes plastic products biodegradable and four complaints and proposed consent orders against companies that marketed various plastics with allegedly false and unsupported claims that their products were biodegradable. 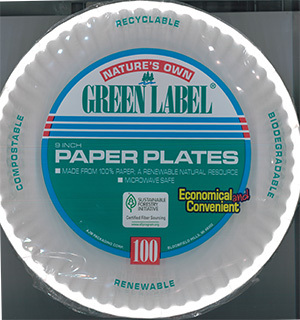 In the civil penalty case, the FTC filed a complaint and consent order against a company for violating a 1994 FTC order that prohibited it from making unsupported green claims for its paper plates and bags. All of these cases are part of the FTC’s program to ensure compliance with the agency’s recently revised Green Guides. The Commission publishes the Guides to help businesses market their products accurately, providing guidance as to what constitutes deceptive and non-deceptive environmental claims. Each of the FTC’s plastics matters and, where appropriate, the proposed consent order, and the paper products civil penalty settlement are detailed below. ECM Biofilms, Inc. is based in Ohio and markets its additives (which allegedly make plastic products biodegradable) under the trade name MasterBatch Pellets. It advertises its additives on its website and through marketing materials, such as fliers and brochures that are available to distributors and manufacturers that incorporate ECM additives into their products. According to the complaint, ECM also issues its own “Certificates of Biodegradability of Plastic Products,” which ECM allegedly uses to convince its customers and end-use consumers that its additive makes plastic products biodegradable. ECM allegedly claimed, for example, that “plastic products made with [its] additives will break down in approximately nine months to five years in nearly all landfills or wherever else they may end up.” The complaint alleges that these purportedly biodegradable plastics do not in fact biodegrade within a reasonably short period of time after disposal in a landfill. Moreover, the complaint alleges that ECM has no substantiation to support its claims that its additive makes plastic biodegradable. The Commission complaint charges ECM with violating the FTC Act by misrepresenting that: 1) ECM plastics (plastics made with ECM additives) are biodegradable and will completely break down within a reasonably short period of time after customary disposal; 2) ECM plastics are biodegradable in a landfill; 3) ECM plastics are biodegradable in a stated qualified timeframe; and 4) that various scientific tests prove ECM’s biodegradability claims. Finally, the complaint charges ECM with providing its customer and independent distributors – through the distribution of its promotional materials – with the means to deceive consumers. The notice order attached to the complaint would, among other things, prohibit ECM from engaging in each violation alleged in the complaint. The FTC’s complaints against the following companies charge them with misrepresenting that plastics treated with additives are biodegradable, biodegradable in a landfill, biodegradable in a certain timeframe, or shown to be biodegradable in a landfill or that various scientific tests prove their biodegradability claims. The FTC also alleges that the companies lacked reliable scientific tests to back up these claims. American Plastic Manufacturing is based in Seattle, Washington, and was an ECM customer until at least December 2012. The FTC alleges that APM advertised its plastic shopping bags on its website as biodegradable, and sold them to distributors nationwide. APM’s marketing materials claimed that its products were biodegradable based on the use of the additives sold by ECM. CHAMP, located in Marlborough, Massachusetts, also was an ECM customer, and advertised on its website that its plastic golf tees were biodegradable. CHAMP sold the tees both online and in brick and mortar stores throughout the United States. The company’s marketing materials claimed that the ECM additive made its products biodegradable. The proposed consent orders settling the FTC’s complaints are essentially the same. They prohibit the four companies from making biodegradability claims unless the representations are true and supported by competent and reliable scientific evidence. Consistent with the Green Guides, the companies must have evidence that the entire plastic product will completely decompose into elements found in nature within one year after customary disposal (defined as disposal in a landfill, incinerator, or recycling facility) before making any unqualified biodegradable claim. For qualified claims, the companies must state the time required for compete biodegradation in a landfill or the time to degrade in a disposal environment near where consumers who buy the product live. Alternatively, the companies may state the rate and extent of degradation in a landfill or other disposal facility accompanied by an additional disclosure that the stated rate and extent do not mean that the product will continue to decompose. The proposed consent orders also make it clear that ASTM D5511 (a test standard commonly used in the additive industry) cannot substantiate unqualified biodegradable claims or claims beyond the results and parameters of the test, and that any testing protocol used to substantiate degradable claims must simulate the conditions found in the stated disposal environment. AJM Packaging Corporation. AJM manufactures paper products, including paper plates, cups, bowls, napkins, and bags, for sale throughout the United States. Based in Bloomfield Hills, Michigan, the company touts itself as a “leading manufacturer of these products,” and refers to its lunch bags and Green Label paper plates as national brand leaders. According to the FTC, through its recent marketing practices, AJM violated a July 19, 1994, Commission consent order that barred it from representing that any product or package is degradable, biodegradable, or photodegradable unless it had competent and reliable scientific evidence to substantiate the claims. The order defines the terms “competent and reliable scientific evidence,” as well as what constitutes a “product or package,” including plates and bags. Based on this conduct, the FTC’s complaint charges AJM with violating the 1994 order by failing to have competent and reliable evidence to substantiate claims that: its products will biodegrade within one year when disposed in a landfill; its products will compost in a safe and timely manner in a home composting pile; and its paper plates are recyclable. order and enter into a new order that contains new language and definitions that reflect updates to the Green Guides that were finalized last year. Specifically, the updated order bars AJM from making unsubstantiated claims that a product or package is biodegradable, compostable, recyclable, or offers an environmental benefit and requires AJM to disclose information needed to qualify certain green claims to avoid deception. The court order also requires AJM to pay a $450,000 civil penalty for violating the 1994 order and enjoins AJM from violating the new order. The FTC can seek additional penalties if AJM violates the new order in the future. The FTC recently released several business and consumer education resources designed to help users understand its Green Guides and environmental marketing in general. These include: 1) “Environmental Claims – Summary of Green Guides,” a four-page summary of the changes in the Guides; 2) “The Green Guides,” a video explaining highlights of the changes; 3) a new page on the FTC Business Center, with links to legal documents, the Guides and other “green” content; 4) a Business Center blog post; and 5) related consumer information. The Commission vote to issue the administrative complaint against ECM Biofilms was 4-0. The case will be heard before an administrative law judge at the FTC, with the proceeding scheduled to begin on June 18, 2014. The Commission vote to accept the consent agreement packages containing the proposed consent orders for public comment in each of the four biodegradable plastics cases was 4-0. The FTC will publish a description of the consent agreement packages in the Federal Register shortly. The agreements will be subject to public comment for 30 days, beginning today and continuing through November 29, 2013, after which the Commission will decide whether to make the proposed consent orders final. Comment on the APM matter. Comment on the CHAMP case. Comment on the Clear Choice case. Comment on the Carnie Cap case. The Commission vote approving the complaint against AJM was 5-0, with former Chairman Jon Leibowitz and former Commissioner J. Thomas Rosh participating. The vote to approve the stipulated final order was 4-0. The complaint was referred to the Department of Justice and then back to the FTC. The FTC filed the complaint and stipulated order in the U.S. District Court for the District of Columbia on October 1, 2013. NOTE: The Commission refers a complaint to the DOJ for filing when it has “reason to believe” that the law has been or is being violated and it appears to the Commission that a proceeding is in the public interest. The order has the force of law when approved and signed by the district court judge.